Unsuck DC Metro: Is Metro Lying (Again)? So ol' Dan "the stesseler" Stessel told the Post the "self evacuation" (Please. Isn't there a better term?) was the riders' call. I know that sometimes a power line is going to fail, or Metro riders are going to be stranded for a while, and that most people are working very hard to make sure that people get where they're going on time. Most of the riders on my car had a good attitude about the inconvenience on Tuesday, and only a few seemed irate. I looked at it as an adventure and a story I'd be able to tell my friends. The thing that burns me up is that the story that's being put out there isn't true, and that riders (who were charged at the Metro fare gates when we finally got out) are being blamed for part of the inconvenience. The Washington Post story implies that the rescue train was shut down deliberately because people started getting off the train and walking on the tracks, but that's not what actually happened. 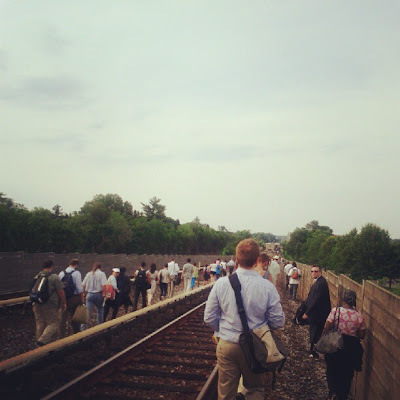 Rather, people started leaving the train and walking on the tracks AFTER the rescue train lost power and after the conductor told us we could leave. There was very poor communication from Metro - only three or so announcements in the 30 or so minutes that we waited on the train. I was tweeting and following #wmata on Twitter during that time, and the only way I learned that the rescue train had failed was from other folks on Twitter. I was on the train about mid-way back, and had to learn via Twitter rather than from the conductor, that the rescue train had also lost power. Lost power - not had it shut off. There was very, very little communication coming from the conductor at all during those hot 30 or so minutes. The conductor eventually told us that we could leave "if we wanted to" because the third rail had no power, not the opposite way around, as WMATA is claiming in the article.